Celtic should be “better” when changes are made to the team, said Brendan Rodgers after the defeat by Hibernian. The Premiership champions missed the chance to return to the top of the table, losing a goal after 46 seconds and another in the second half. Rodgers made four changes to his team following Thursday’s Europa League defeat by Salzburg. “I expect with what we’ve got to be better than what we were,” said Celtic manager Rodgers. “We didn’t have the players to play how we’ve been normally playing. At this stage of the season, of course I know what my best team is but when we make changes, we expect to be better. Player rater – who was man of the match? 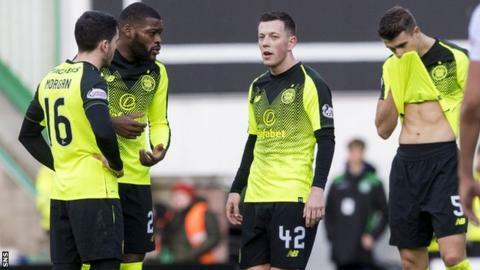 It was Celtic’s third league defeat of the season and the third time in four domestic away matches when they have dropped points. “It’s disappointing all round,” Rodgers told BBC Radio Scotland’s Sportsound. “We didn’t start great of course. We just went chasing the ball, left the spaces open and very quickly we were 1-0 down. Not the best start. “Our game wasn’t great after that. We were too rushed in our build-up play. The moments we did get into some good areas we didn’t have that final pass and final bit of quality in and around the box. Rodgers was also asked about his January transfer window plans but said: “I’m not even thinking about it, to be honest. It should’ve been a better performance from Celtic. The players they’ve got on that pitch are more than capable of winning any game of football. It’s one of the games where things never went for them and Hibs were right on their game.